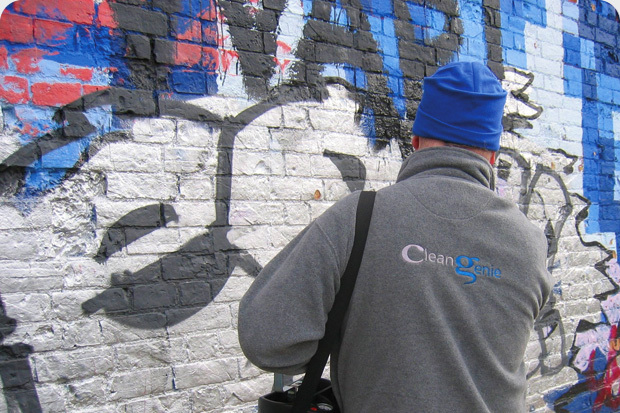 Clean Genie regularly removes Graffiti from walls and exterior paintwork. Our graffiti removal equipment utilises a specialist range of chemicals to effectively remove graffiti in as environmentally friendly a way as possible. This process uses a range of techniques from soap and water to a fine water jet sprays combined with highly effective chemical solutions. We are able to remove offensive graffiti often within 24 hours of notification. Graffiti removal is charged by the square meter and is subject to site survey.